Fueling the impasse announced yesterday between the teachers union, UTLA, and LA Unified is a dispute over so-called “unaccounted” sources of money that the teachers union says could be used for raises and other demands. 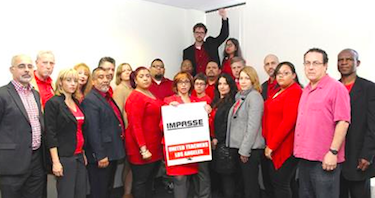 “We are bargaining in good faith but when we uncover a $59 million pot of money the district doesn’t know if it still has, it doesn’t build a lot of confidence when they say they’re broke,” UTLA President Alex Caputo-Pearl told LA School Report today. He is referring to a $59 million one-time Common Core fund that was split up and sent to individual school sites at the start of the year. According to the district, schools were given autonomy on spending, and it’s only now that they are reporting back to the central office how the money has been used. As information dribbles in, it has left a lot of confusion on the running total thus far. Tom Waldman, a district spokesman, confirmed today UTLA’s claim, that the one-time funds expire June 30, meaning anything left unspent will vanish. “Obviously, no one is saying this money will solve all of our financial difficulty,” Caputo-Pearl added. “But how do we know there aren’t more sources of money we don’t know about?” he asked. Another point of contention leading the union to seek a neutral third-party voice in the stalled negotiations, is a new report by the California Legislative Analyst’s Office, projecting another $2 billion in state revenues next year. “Much of that will go to K-12 education,” Caputo-Pearl said. However, district officials say it’s too early to begin counting those chickens. Final school budget numbers are reported in May. In the meantime, Caputo-Pearl says the union will strive to reach a compromise with the district even as the two sides are requesting mediation from the state Public Employees Relations Board. To generate more public support for its contract demands, UTLA is planning a rally, called “Making our stand at Grand,” at Grand Park on Feb 26. Speakers will include the presidents of the California Teachers Association and the California Federation of Teachers, along with the president of National Education Association, the nation’s largest teachers’ union.